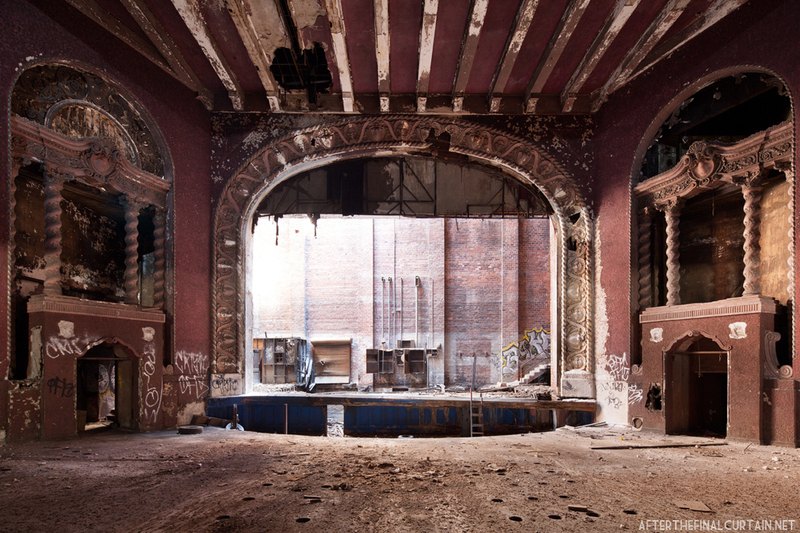 The Majestic Theatre opened on February 26, 1928 in East St. Louis, Illinois. It was designed by the Boller Brothers for Harry Redmon and Fred Leber. The Boller Brothers were known for the Missouri Theatre in St Joseph, Missouri. The Majestic was nicknamed “The Million Dollar Theatre” due to the high costs of building the theater. View of the main level from the side of the balcony. The 1,743 seat theater opened with a performance from Al Jolson and George Jessel, two famous vaudeville performers. Redmon ran the Majestic for a year before leasing it to Great States Theatres which was part of the Paramount Theatre empire. A vitaphone system was installed in September of 1928, making the Majestic one of the first in the area to have talking motion pictures. 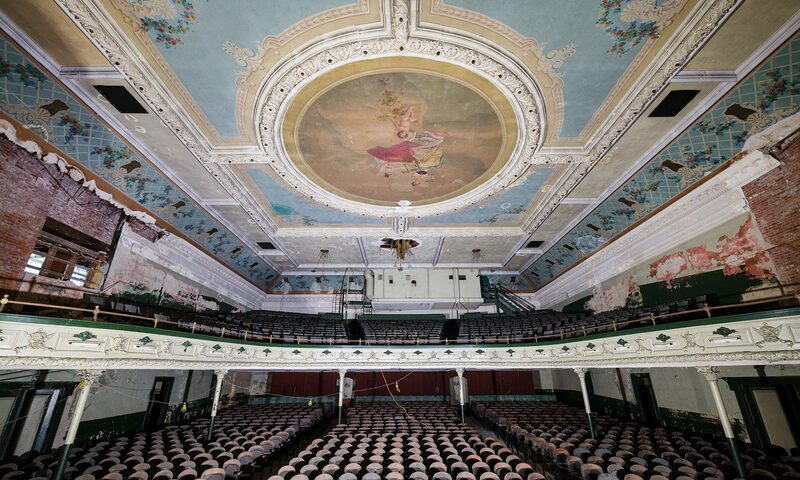 It was also one of the first theaters in the area to have an air conditioning system. In 1954, a curved Cinemascope screen was installed in the Majestic. The new screen was double the size of the original, and a new projector had to be installed to compensate for the increase. The lobby of the Majestic Theatre. 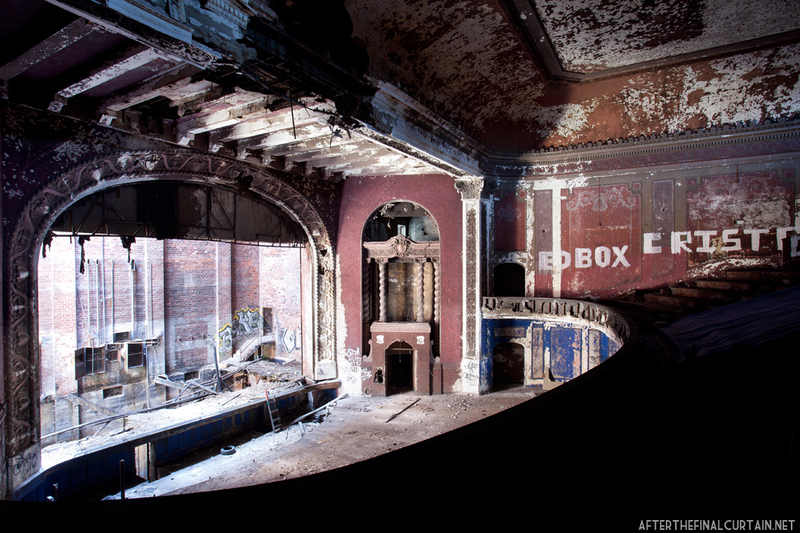 The Majestic closed in 1960 due to declining ticket sales and high operating costs. 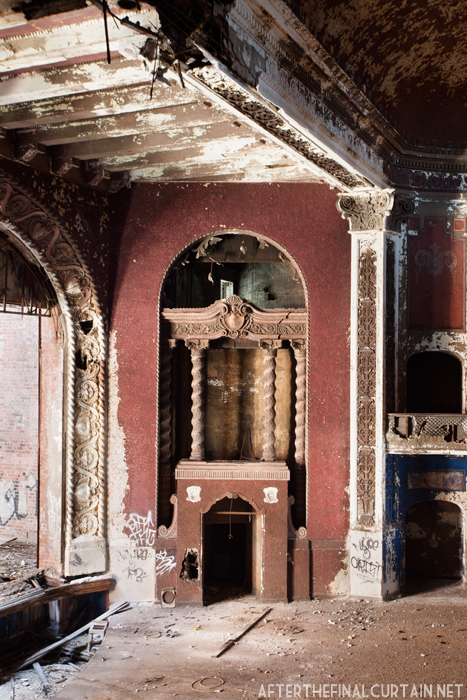 Numerous proposals were made over the years to restore the theater and some renovations were made — a new roof, new windows, and new doors were added to the theater in the 1970s, but the rest of the theater remained untouched. It was added to the National Register of Historic Places in 1985, and in 1998 a bill was proposed to fund the restoration of the theater, but the bill did not pass. 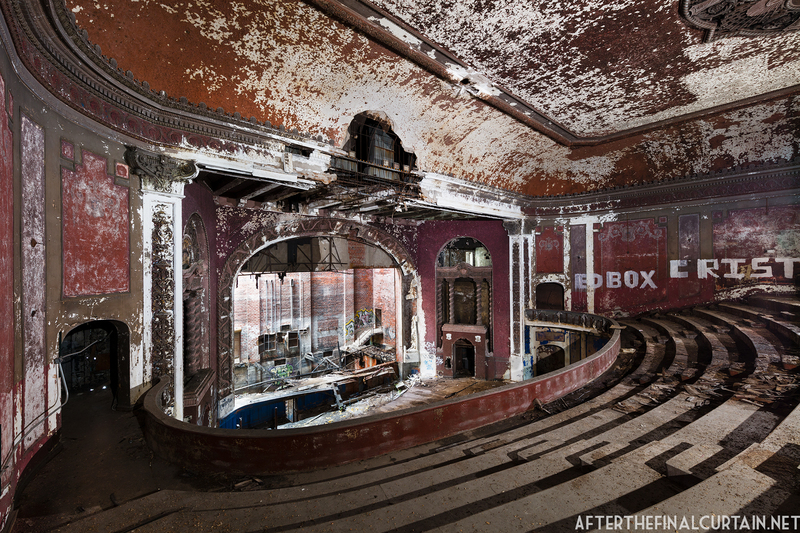 The seats and ornamental fixtures were removed after the theater closed. 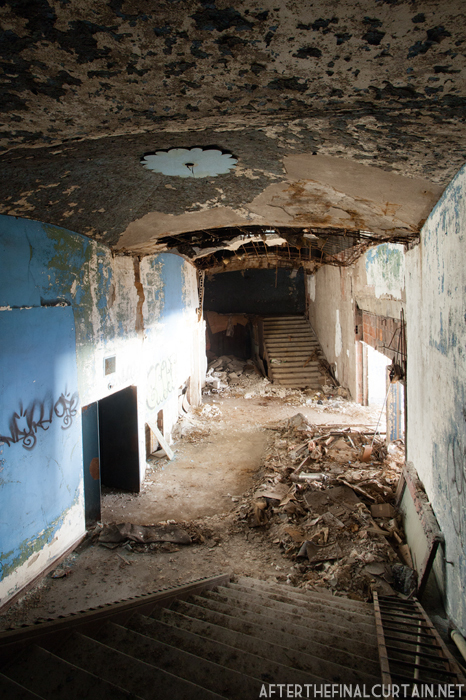 The balcony level hallway of the Majestic Theatre. A close up of some of the plaster work to the right of the stage. Trees are growing out of the theater’s facade. The blue tarp was placed on the balcony to help divert the flow of water from a hole in the ceiling. The roof above the stage collapsed in the years after the theater closed. Is it beyond saving at this point, or could some major restoration happen if the funding were there? It’s not beyond saving in my opinion, but it would take a lot of work to restore it. However, I’m not sure if the population could support it. Who currently owns the theater? Do you know what their plans are for it? 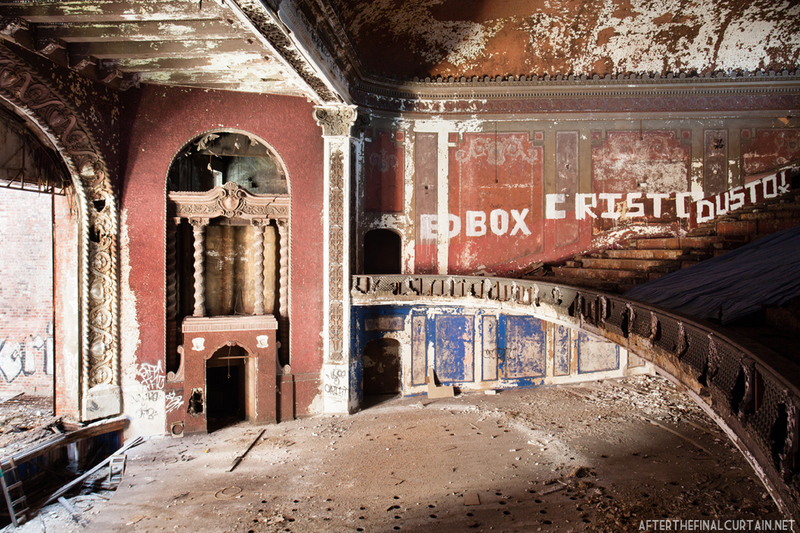 Robert – The city of East St. Louis currently owns the theater, and as far as I know there are no plans for it at the moment. This place must have been charming. Great scale in architecture and cast decor. Unfortunately without a stage roof it might have two Illinois winters left before it’s beyond hope. East St. Luois is not an economic engine for the region (to put it nicely). I think it will have a bit longer than that. 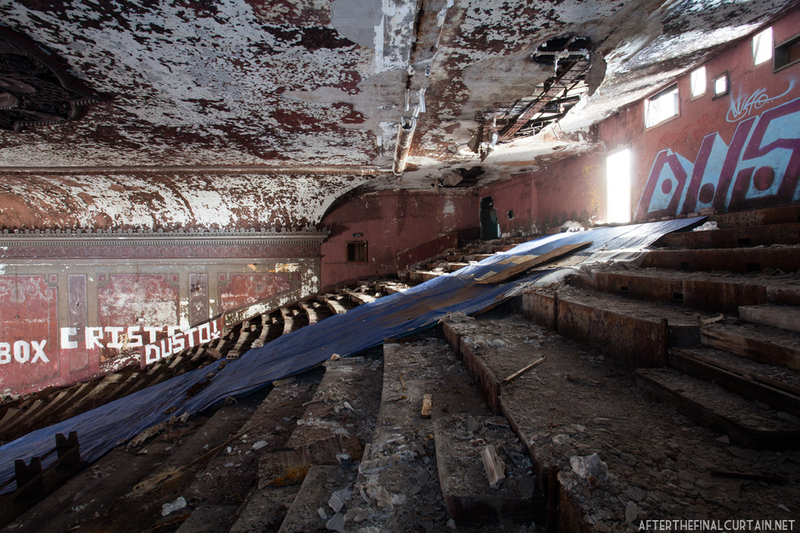 The stage roof rotted away years ago, and the rest of the auditorium is still there. The stage itself has collapsed though. Thanks for this post. I live downtown St. Louis and have always wondered what was behind the tiled facade of this theater. Love your blog! Loved the photos. I used to go to movies here as a kid. My brother and I would ride the bus downtown without our parents when we were about 7 and 8. The town was perfectly safe and kids were everywhere. It was 25 cents for the kids Saturday double feature plus cartoons and the place was packed. Bus fare was a dime. The Wurlitzer organ from the Majestic is now the lobby organ at the FOX theatre in St. Louis. When we were a bit older, we could ride the bus over to the FOX theatre or any of the other St Louis theatres to see movies there as well. East St. Louis was a wonderful, safe middle class city until the Black Power Movement began in the late 1960’s. My dad, John Sczurek also worked at Obear Nester Glass and my grandfather Harry Geiger was one of the motion picture operator for the Majestic Theaters. My mom would tell us how beautiful this theater was and how she would go to work with her dad and watch the movies. They both grew up in East St Louis, IL when it was a booming city. Unfortunately, I never ever got to share that same experience. I doubt that it can be saved. You can see the rear of the building from the Metrolink station at 5th and Missouri and the center of the structure has collapsed from top to bottom. Driving down Collinsville Avenue in downtown East Saint Louis is disturbing because I’m old enough to remember when this street was thriving. Bob – I think you’re thinking of the apartment building next door to the theater, unless the Majestic has collapsed in the past 6 months. You are referring to the back of the Murphy Bldg., next (south) to the Majestic. Murphy Bldg. is the one with the trees growing out of the roof. I can’t imagine that it would ever be restored. What would be the point? I hope the people who systematically destroyed what was once a nice place to live are pleased with themselves. Who would that be? There were many circumstances that lead to the demise of East St Louis, IL. This building caught my attention, even in its current state of abandonment, as I traveled west on I-55/70. I had to get on google maps to find it so I could get a better look at it, and find out what it was. My research led me to this page. Thanks for posting all the images. The architecture is awesome. Wish I’d have been around to see buildings like this in their glory days. I was wondering if there was a way to get inside? i saw where it said new doors were added and i wasnt sure if that meant it was locked up or not? i wouldnt want to break in or anything like that but if it is not open do you know a person i could talk to and see if they could open it for like an hour of one day? ive been searching for a different place for senior pictures somewhere i havent seen anybody else go and i feel like this is a good place. You’d have to contact the city. They’re the current owners. I also grew up in E St L, went into the Army in 1/67. You could still visit “downtown” ESL in the 60s, but when I came back from the ‘Nam in 1/70 ESL was about “gone”. The city’s industrial base had left (primarily due to too many union demands) and the population had changed. The city died an agonizing, slow death. No government money will ever resolve the problems in ESL…I’m glad to see that “the government” didn’t spend the funds (our tax monies) to save the Majestic. It would’ve been an extreme waste of money. The current population of ESL depends on “government” money for food stamps, ADC, etc. Too bad, really sooo sad. Nice memories of going to the Majestic as a kid, too bad the current inhabitants of ESL care little about their city or environment. That is an untrue statement to make generalizing and entire population. You are very presumptuous, when you do not know and unaware of all conditions at hand The old inhabitants practiced and carried out a lot of racist and chauvistic behavior so does that benefit the current inhabitants that inherited the condition of the city as well. Maybe you should watch a documentary on Channel Nine ( broadcast) the history of East St. Louis, and see how it all began and then you will have a second opinion on matters, and you will become more logical in your thinking. Go on line and get it pbs,org and search for the history of East St. Louis as well. When you are privileged it is easy to point the finger at some one else, the reality is why do conditions exist and who created certain situation that could have been avoided. Human have always shared a responsibility for failure. Putting the blame on the present inhabitants is certainly not the answer nor is an excuse to put the blame on the past inhabitants there is a dual blame. Humans have not learned how to live on this planet in a wholistic way. instead when have learned to live in on it in an animalistic way. I certainly am an inhabitant that cares about my environment but i can not do it alone, I abandoned by bartender/ server career to lead this city to freedom Just like the musician of Poland did. Will you be willing to help this city get on the ball. I challenge you to this hard fight and test. Thank you Kirk for responding to that previous comment that Gerald made. Some people are so narrow minded in their thinking and their perspectives, that they can only see what’s before their naked eye. They do not stop and ask the question or really care to do adequate research on how systems in place, such as racism that showed it’s ugly face back in those former days, so called, “thriving times” , may have been full of industry and growth for a certain segment of the population, was also filled with segregation, racial tension, dishonesty, and lot’s of pain and turmoil for others. At some point, no matter how good you may think things visibly were for the town/city of East St. Louis, there existed a racial divide that destroyed this community long before you could visibly see it’s physical destruction. No one speaks about the condition of all the people, not just the result of what you see of it today. In order to have a vibrant and economically sound community, there needs to be a balanced scale of inclusion of all the people who made up this area. Please understand the truth about why major businesses abandoned this community in the 60’s and 70’s. Please understand how race played a huge factor in entire families moving away and taking businesses with them, the truth about why people in huge numbers abandoned this city, understand even in the early days the destruction of this community due to the Great Fire. I get so tired of so called, educated people blaming everything bad that happens to communities across this land on the under-privileged, as to imply that somehow this group doesn’t care as much as other citizens in this socio-economic landscape. The underprivileged are not the key players that would have the type of power or control that would shape a community all by themselves. Please understand the Law and principal of cause and effect, Gerald and know your history before you make such a generalized statement ,so that at least it has validity and truth. The poor can’t conveniently just walk away like so many did with resources and means. Time and time again, they inherit the problem. The disenfranchised are not the real owners of this catastrophe, it was the true power players, the businesses, business owners, corrupt politicians from many many years past that robbed, cheated, and abandoned this community. They left the aftermath of their ugly bruised marks on this city and it is so naive or/and it shows a lack of knowledge and compassion to make a general comment stating that the people who live in this town do not care. This is such a mis-perception and a biased perspective. There are cities all across America, structurally, just like East St. Louis that are in the similar condition today: Gary, and Detroit just to name a few. America needs to wake up, We have to deal with each other, learn how to live with one another in peace and be diverse and inclusive in our efforts, strategically and if not..we will have to take ownership and accountability for what we leave behind! The problem will manifest into a bigger problem, national and world, as we are seeing now. It will spill over into our newly formed, perfect little secluded communities that we build further and further away from these former, once thriving communities that we now refer to as our , “inner cities”. 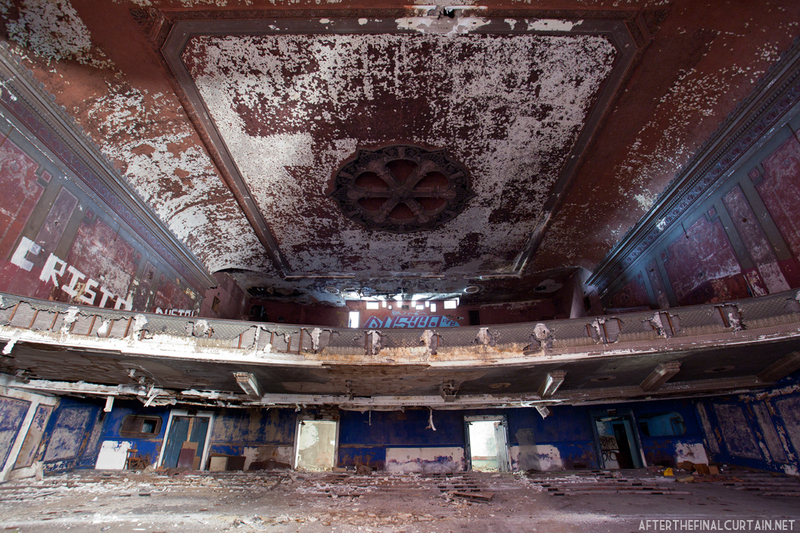 You do know that this is a website about abandoned movie theatres, don’t you? Your essay blaming whites for the current situation in East St. Louis is nuts. I know the history of East St. Louis. It has been under the complete control of African-Americans for 50 years. Your belief that African-Americans are too dumb, lazy, and lacking in talent to run their own cities without whites is about as racist as you can get. It was such a lovely city,we all know what happened to it, I have so many fond memories of Collinsville Ave.,the Majestic of course also great store,Stanley’s,Seidels,Lerners,many more,I hope they r happy with the trash they have created ,such a shame,what a waste. It is a shame what neglect, a lack of funds, vandalism, time and the elements have done to this “majestic” edifice. I, too, remember the days when the street was lined with clothing shops, jewelry stores, etc., and was THE place to shop. 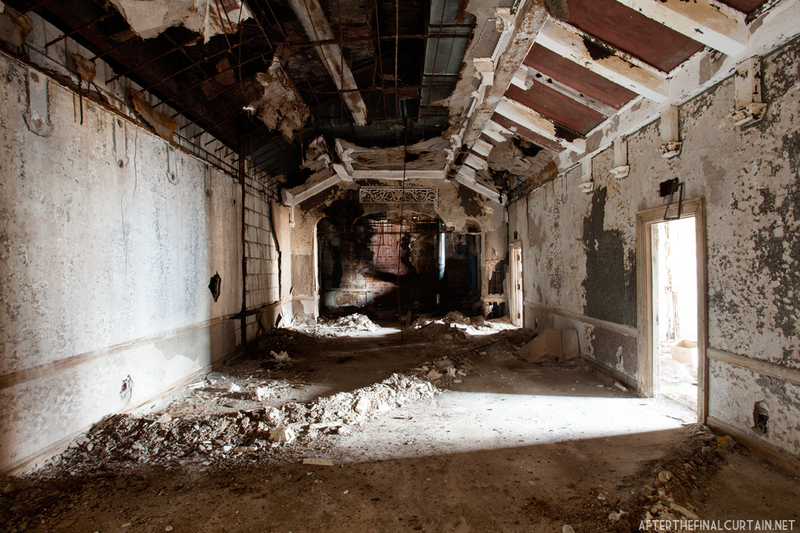 Unfortunately, even if the funding was available to restore the building to its previous grandeur, who would visit the area as it now is to see it? Sad. I worked in the Majestic in the 50’s. I was born and raised in East St. Louis and it was a wonderful family town–extremely safe–no locked doors–good people. Many churches and different ethnic groups. People looked out for their neighbors and the children. I wouldn’t give a plug nickel for the place now–it is a total devastation. What a sad ending to a lovely, friendly family town. I see you posting was over three years ago. My grandfather had some type of connection with Mr. Redmond as I believe my grandfather moved from Kentucky to help build the Majestic. The 1930 census shows my grandfather was a janitor there, his son and daughter worked there. Later in the late 40’s my brother worked there, my girl friend worked there in the late 50’s, and I had high school friends who worked there. The Majestic had the same manager throughout the theather’s life and he also managed the French Village Drive-in. What happened to East St. Louis was terrible but the city didn’t have as much industry as you think as most large companies were outside the city in neighboring communities thus smaller tax base. After high school in jan 1960, I worked for the NYC railroad down on the river waterfront. It was a great town. Never locked our doors even when we went on vacation for a couple weeks. I have always contended that East St. Louis would make a great airport for St. Louis. Get a car company to move in and build Honda, etc. You could recover, but not he way it is today. It must have been something in it’s day. While it is a shame to see it deteriorating beyond repair, it is a fitting symbol of what led to the city’s state; the Dems had their way from A to Z with this town for a long time now. Gotta love it. It was something before television. Used to wait behind red velvet ropes to get into the theater, line were long at some movies. It was a beautiful theather and I think it was Thursday night they would have a draawing. My brother won a nice range one time. Had a lovely organ that raised out of the bandbox during intermission and someon eplayed music during the break between films. Always two films, newreel, and a cartoon for about 65 cents I think. On saturday, kids could watch numerous cartoons and a movie (cowboy, Buck Rogers,etc) for 25 cents. Great entertainment before TV. Then in 1947 KSD-TV (NBC) started broadcasting in St. Louis, followed shortly after by KMOX-TV (CBS). Went to many shows there as a kid. Would take the bus downtown with my parents. It had a frosty look on the marquee saying “Cool Inside”. Even the concrete in front of the Majestic was green. Air conditioning was a big draw when it was built. In the balcony level the walls were green with a woods looking touches. Have always thought someone would buy the front facade. It is still beautiful.. Many shows there as a kid. A couple of years they had a “Midnight Show” that began at midnite. Kids lined up for half a block waiting to get in. Nothing to be afraid of. Full length feature (usually a Universal Picture) and a live stage show….”Dr. Silkini’s Chamber of Horrors” which featured Frankenstein and other creatures. At stage right was a set of steps…the monster came down and as he got to the audience, all lights in the house went out. Then pandemonium. This was in 1950-51-52. Hard to forget these kinds of memories. Great theatre, 2nd floor mezzanine was plush. Down Collinsville Ave., and across was the old Avenue Theatre. Kids got in for 10 cents. But it was’nt the place the Majestic was. I was born in East St. Louis in 1960. The theater closed that year so I never got the chance to experience her glory. I’ve always had a love for this building and this town. 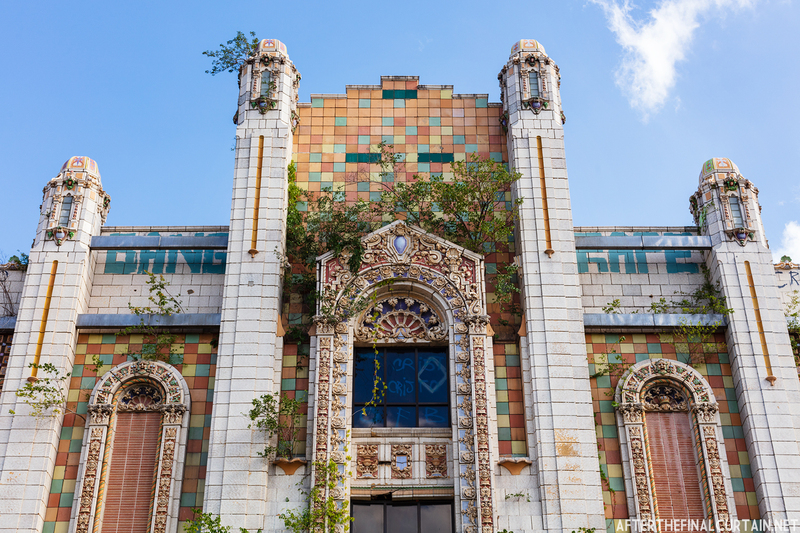 City government could never restore the Majestic, the funds are just not there. A job like this would take the efforts of the people! The same people that claim to great memories of her. You see it’s so easy to pass by on the interstate and lay blame! If you took a hard and honest look at the truth, you would understand why the Majestic is in the state it is in today. With all that aside, no problem is too great to tame! This project would be a tall order but it could be done! Just think, where would we be as a people if we turned our backs at every little sign of adversity. I may not be the ONE to start the movement but all it takes is ONE! So sad what has become of the Majestic…..I went to high school in IL near East STL in the late 70’s & the town had gone way downhill by then….would’ve loved to have seen it in its heyday as a few of my friends still remember it…..wish I could’ve had some nice memories from of the Majestic….I am just fascinated w/ historical old buildings….. I think the theater was remodelled inside in the late 1940’s (may be 1947) when Bambi came there. The theater was painted in the theme of the movie. The carpet was thick red or maroon wool. And we would consider ourselves civilized . Wow! Are we? I hope one day to be the one to polish a diamond in the rough. are gone. I wish I could post the photos here but you’re welcome to grab them on my Fb page.